Throughout the course of a long and well-lived life, we enjoy incredible adventures, make lifelong friends, and gain increased wisdom. However, we also gather some less-than-pleasant experiences: repetitive use injuries, unforeseen surgeries, and reduced mobility. Elderly physiotherapy rehabilitation can help. Though we all slow down as we age, getting older doesn't automatically consign you to increased pain and decreased the quality of life. Even if you've had a serious injury or surgery, physiotherapy elderly rehabilitation is always possible. 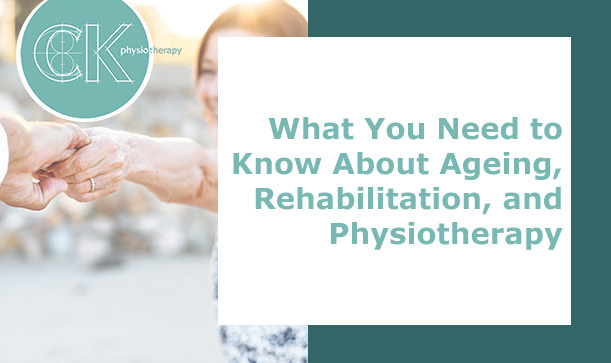 By understanding what causes injury—and how interventions like physiotherapy help in the rehabilitation process for the elderly — you can reduce pain, regain some mobility, and get back to enjoying your life as usual. A lifetime of activity, coupled with factors like decreased bone density (osteoporosis), means that elderly people are vulnerable to certain injuries and surgeries. When left untreated, these conditions can greatly decrease mobility, increase dependence on others, and reduce the quality of life. Let's cover some common injuries and surgeries, then look at some tips on how physiotherapy for elderly patients can help the elderly to cope. As our bones lose density, we become more and more prone to fractures. In a hip fracture, one suffers a crack or break in the femur (leg bone) near the hip. This often requires surgery and can necessitate a lengthy convalescence period. You might require elderly care physiotherapy and specialized exercises to regain some mobility and retain flexibility in the joint. Fractures can also impact our spinal health. Your spine is composed of many small bones known as vertebrae. When bones weaken or lose density, these vertebrae can become damaged and collapse. This is known as a vertebral compression fracture, which requires medical attention and extensive rehabilitation to regain mobility. Throughout our lives, our spines work hard to keep us mobile—twisting, bending, moving, and rotating in all directions. Unfortunately, many people suffer from varying degrees of back pain in their daily lives. This can be caused by something as simple as tight muscles and can be caused by poor posture. Alternately, a back injury can involve a slipped or prolapsed disk, which involves the cartilage disk inside your spine pressing on a nerve. The causes of back pain are many, but thankfully there are also many ways to strengthen, stretch, and rehabilitate your back and physiotherapy for elderly at home is possible. After a long life of repetitive tasks (cooking, typing, golfing, lifting children), many begin to feel pain and inflammation in the upper extremities. This can occur in the forearms, elbows, wrists, hands, shoulders, and neck. Often made worse by poor posture or hobbies, repetitive strain injuries can cause long-lasting pain and inflammation. The good news is with the appropriate physiotherapy exercises for the elderly and adjustments, you can definitely help your body recover from these injuries. Around 10 million people in the UK suffer from arthritis, which often develops in adults ages 40 and older. It's characterized by inflammation in the joints. As the smooth cartilage that lines the inside of joints gets damaged or worn away, simple motions can cause pain and limit movement. Although it can occur in any joint, it often affects the knees, hips, spine, and hands. Though there is no cure for osteoarthritis, strengthening and stretching the surrounding muscles can help take pressure off the joint and decrease pain. If you've already suffered an injury such as a hip fracture—or you're dealing with chronic back pain—there's no need to resign yourself to a pain-filled life. Although you might not go back to the spryness of your twenties, you can certainly speed up your rehabilitation process with these simple tips. 1. Back Strengthening. You can strengthen your back with simple exercises, after gaining the clearance of a physician. For example, "the bridge" is a simple exercise that helps strengthen your back and core. Start by lying on your back with your feet on the floor. Gently left your pelvis and buttocks off the ground until you reach a comfortable point. Squeeze your muscles, holding for a moment, then release back to the ground. 2. Stretching. With a physiotherapist's okay, you should stretch every day. In addition to aiding in relaxation (and feeling lovely!) stretching helps keep muscles healthy. As an example, you can help bring mobility back into your neck with this simple stretch: sitting in a supportive chair, gently stretch your neck to the left side by bringing your left ear closer to your left shoulder. Hold for a moment until you feel the release. Then, return to centre and complete the stretch on the other side. 3. Swimming. Because of the fluidity of water, swimming is one of the best ways to help rehabilitate your joints. With a doctor's orders, see if swimming could help you get some motion into your joints. By joining a local indoor swimming pool, you can get all the relaxing, strengthening, and flexibility benefits of this low-impact sport. And it's fun, too! 4. Walking. Though it seems simple, walking is actually an effective and simple way to get the exercise you need while you're recovering from a surgery or a repetitive use injury. In addition to working your muscles from your legs to your arms to your core, walking can help get your heart rate up. Start small, and comply with a doctor's suggestions to get the most benefit. Sometimes, the simplest tips are the most effective. For those suffering from arthritic pain in the knees or hips, that simple solution might come in the form of appropriate footwear. Improper shoes can create unnecessary strain on our joints and exacerbate pain and osteoarthritic symptoms. Though it's important to consult with a trained podiatrist to find out what's right with you, flat and flexible soles are generally considered more supportive of the joints. This tip applies to other areas of your life, as well. If you are driving, make sure to support yourself with proper lumbar support. If you frequently sit, try to prioritize the proper, ergonomic support in this area as well. In every aspect of your daily life, ask yourself: does this position feel comfortable and supportive of my recovering body? If not, be prepared to tweak or adjust as necessary. Manual Therapy—In this technique, a physiotherapist uses their hands to manipulate your body's soft tissue. This can help encourage better blood flow, help you relax your muscles, and help your body regain its normal patterns of movement. Exercises— Physiotherapists are highly trained to understand your body as a system of interconnected muscles, nerves, and bones. Based on your condition, they'll prescribe exercises that will actively help you retrain muscles, regain coordination, and retain your flexibility. Many of these exercises will be done alongside your therapist in your session, while you'll be instructed to practice others at home. Advice—Another important aspect of this speciality is advice. Your physiotherapist will help you analyse your posture and habits. This can be extremely helpful in the case of repetitive use injuries, as they can advise you on changing your motions to achieve greater health. Those dealing with physiotherapy elderly care and the challenges of injury, pain, and reduced mobility in the elderly need not despair. With a team of compassionate trained professionals — and some patience and dedication — it's more than possible to regain some of your independence, decrease your pain, and improve your quality of life. To discuss how you can get started on your path to better physical health and quicker rehabilitation, please contact us at CK Physio, private physiotherapy for the elderly, today.